The Federal Aviation Administration (FAA) has published its newest Obstruction Marking and Lighting advisory circular that became effective Friday. It includes significant changes to the telecom industry’s lighting requirements since the last time the agency revised Advisory Circular 70/7460K in 2007. A key change in the new document — that has been proposed by the industry for a number of years — is the ability to have a structure up to 700’ tall be lamped with medium intensity lighting. Previously, from 500’ to 700’, expensive and power-consuming high intensity lighting was required. 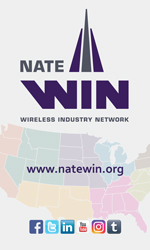 Manufacturers contacted by Wireless Estimator said they expect to see many tower owners take advantage of the revision. In addition, removing high intensity lighting will be appreciated by neighbors near the structure, they said. 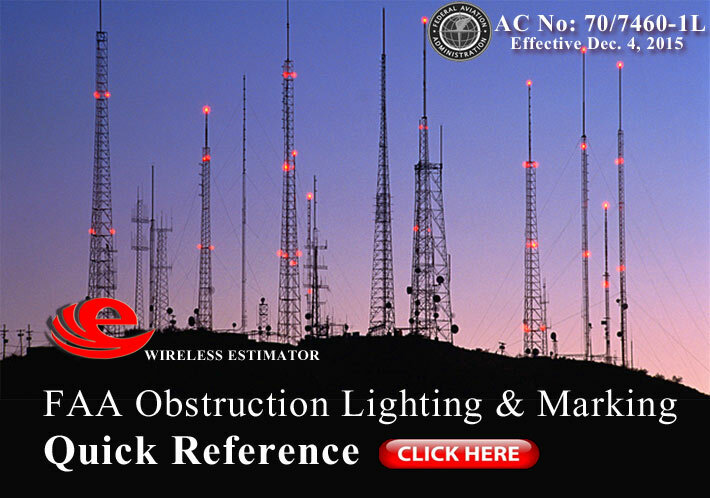 It’s not necessary for contractors and tower owners to try to distill the new 90-page document’s important changes that will affect their new and current structures, and installation and reporting requirements, since Wireless Estimator has provided a Quick Reference Guide that will easily explain the changes. It also provides information regarding lighting for other structures and makes available the previous advisory circular for a quick comparison of changes. The inclusion of flashing L-810 side lights (mandatory on September 15, 2016), registered concerns from a couple of manufacturers. The FAA found through studies that steady burning side lights attracted birds to tower structures and many migratory birds were killed by hitting guy wires. For towers such as Style A1s and E1s the FAA now requires that the markers must be flashed in sync with the flashing beacon which has been increased from 20 to 30 flashes per minute. However, Per 2.4.2 of the advisory, the markers now have become reportable for NOTAMs, thereby increasing the potential for considerably more NOTAM filings for towers up to 350’. A number of lighting manufacturers believe that the addition of an allowable aircraft detection lighting system might be advantageous for wind farms and other applications, but for the telecommunications community their concern can be summed up in two words: too expensive. The design allows for sensor-based technology to detect aircraft, and as the plane approaches an obstruction, the appropriate lighting system will be turned on. But the additional price for the radar interface would cost from $100,000 to $120,000. Standards for voluntary marking of meteorological evaluation towers (METs), less than 200 feet above ground level has been added in the advisory to provide recommendations towards increasing conspicuity of these structures, particularly for low-level agricultural flight operations. These standards include those for lighting and marking of the tower and associated guy wires. Obstruction lighting manufacturers were provided the opportunity to provide their input regarding the FAA’s proposed changes, however, the number of drafts that they received from the FAA for review varied from company to company. FAA Advisory Circulars are informational documents produced by the Federal Aviation Administration to inform and guide institutions, operations, and individuals within the aviation industry Advisory Circulars are intended to be informative in nature and not regulatory; however, many times they describe actions or advice that the FAA expects to be implemented or followed.